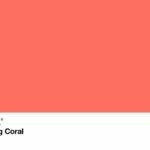 This year’s Pantone Color of the Year is Living Coral, and it started me thinking about the organic gem that the color is named for. Coral has been used in jewelry for thousands of years. First century Romans used it to ward off evil and impart wisdom. Their children wore branches of the stuff around their necks to keep them safe. Coral was extremely popular in jewelry made during the Victorian Age. Again, it was seen as good luck to wear it, as it would keep away evil spirits. Lately, coral jewelry, especially vintage and antique jewelry, has seen an upsurge in value. 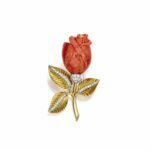 At a recent Sotheby’s auction, the beautiful coral brooch below sold for $27,500. Part of the reason for the increased value may be the decreased supply. Coral is harvested from tropical or subtropical oceans. It takes thousands of years for the tiny marine animals, called coral polyps, to build the branch-like structures. Made mostly of calcium carbonate, the structures survive long after the little animals that built them. But years of over-harvesting, combined with rising ocean temperatures and sea levels, have depleted the supply. The Mediterranean Sea used to be the main source of coral, but not anymore. Waters off the coasts of Australia, Japan, Malaysia, the Philippines, Taiwan, the Midway Islands, and the Canary Islands are major sources of coral today, but many have strict government regulations on the amounts of coral that can be harvested. The state of Hawaii protects its black “King’s” coral as an endangered species. 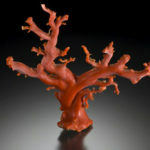 Coral is usually associated with a warm reddish-pink color. But gem quality coral comes in many colors–white, cream, pink, orange, red, dark brown, gold, and black. Coral can even be blue, purple, or lavender! The most common color is white, but the most prized color is red. The coral used in jewelry is not usually dyed, but it doesn’t hurt to ask, especially if the coral is a deep red. 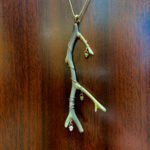 The Gem Coral pendant we have in the store is a custom design in 14 karat gold. The coral is cream and brown. The accent stones are green and white diamonds. 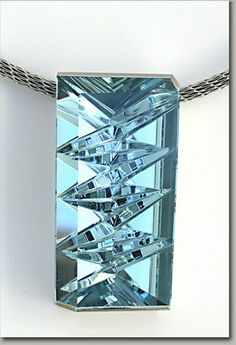 It’s such a unique piece made here at Dearborn Jewelers. Pantone describes its newest color of the year, Living Coral, as “vibrant yet mellow.” It personifies the color with adjectives like “sociable”, “spirited”, and “nourishing.” I would agree with them that Living Coral, both the color AND the gem, embody our “desire for playful expression.” Wearing a piece of jewelry made with coral just makes you feel good. It’s bright, it’s fun, and it’s approachable. It reminds you of Spring! Every year, since 1984, the AGTA (American Gem Trade Association) hosts competitions to bring out the best jewelry designers and stone cutters in the industry. Qualified judges are selected to narrow the many entries down to first, second, third, and, sometimes, fourth place finishers. The Spectrum Awards and the Cutting Edge Awards are considered the world’s preeminent competitions for design with colored gemstones and cultured pearls. Here at Dearborn Jewelers, we design a lot of jewelry, both to sell in the store and for individual customers. We purchase colored gemstones to put into our designs, and the cutting of those gemstones is of ultimate importance. If a stone isn’t cut properly, it will not reflect light well and could look ‘sleepy’. A great stone cutter can add tremendous value to the gemstones he/she cuts. This 91.36 carat gem is an unheated yellow Ceylon Sapphire, cut by Kenneth Blount. Cut by Mikola Kukharuk, this oval tsavorite Garnet is 80.25 carats. 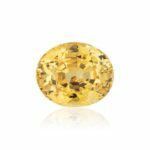 Mark Gronlund took the honor for Innovative Faceting, with this 96.30 carat round spiral brilliant-cut Topaz. 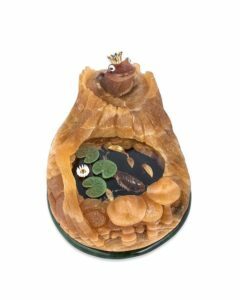 This carving of a Frog Prince looking out over his lily pad pond features Sunstone, Sapphires, Diamonds, Opals, black and green Jade, Chalcedony, Calcite, and 14K yellow gold. Created by Dalan Hargrave. 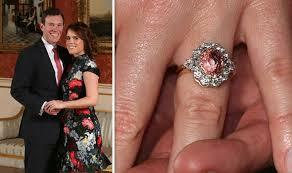 Padparadscha sapphires are more popular than ever, thanks to Princess Eugenie of York and her fiance, Jack Brooksbank. Her engagement ring, which the two designed together, holds an estimated 5 carat padparadscha, and is surrounded by 10 round and 2 pear-shaped diamonds. Because padparadscha sapphires are the most rare of all sapphires, and because they’re seldom cut above 2 carats, Princess Eugenie’s stone is a world class gem. The estimated value of her ring is $175,000. The two tie the knot on October 12, 2018 in beautiful St. George’s Chapel at Windsor Castle. Although the ceremony is rumored to be at least as grand as Prince Harry and Meghan Markle’s wedding, it’s uncertain whether those of us who live outside the U.K. will be able to watch the wedding ceremony. The BBC, the major broadcasting station in the U.K. declined to televise Princess Eugenie’s wedding, thinking that the number of viewers would not justify the cost of production. Another, more local British station, is planning to televise the full wedding, so we’ll have to see whether the ceremony airs here in the U.S.
Padparadscha is a variety of sapphire based on hue and saturation of color. And these traits can be subjective! Narrowly defined, a padparadscha is supposed to be from Sri Lanka and it’s supposed to be pinkish-orange or orangish-pink. It does not have to be highly saturated and, in fact, a delicate color is preferred. But where exactly is the line between an orange sapphire, a pink sapphire, and a padparadscha sapphire? Even gemologists have a hard time agreeing on a uniform standard for this gem. Because the premium for a padparadscha is so high, there is incentive to stretch the narrow definition. 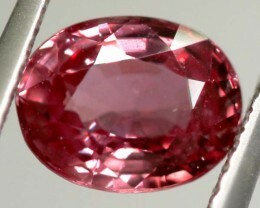 While Sri Lanka is the traditional source for padparadscha sapphires, other countries such as Vietnam, Tanzania, and Madagascar also produce them. The name, “padparadscha”, comes from the native language of Sri Lanka and means lotus blossom. A lotus flower is a little more pink than peach, so some people talk about the hue of a padparadscha as being a “sunset color mixed with a lotus flower.” Well-known author and gemologist, Richard Hughes, calls it “a marriage between ruby and yellow sapphire.” However it’s defined, a padparadscha sapphire is a beautiful gem and well deserving of the extra attention it’s receiving! Green has always been my favorite color. My first 10-speed bike was green. My high school class ring had a simulated emerald in it, and my favorite beach is the Green Sand Beach on the island of Hawaii. Turns out that green is the most soothing color. Scientific evidence points to green as the color that calms the ‘cones’ in your eyes. When I first heard of ‘rods and cones,’ I was in gemology school. Before a colored stone test, the teacher would tell us to go outside and “look at green.” She felt we’d do better on the test because our eyes would be rested. Optometrists will tell you that ‘rods’ sense dark and light, but ‘cones’ sense color. And their peaceful color is green. It’s also true that more gemstones are green than any other color. Why is that? Well, one reason is because so many elements in the earth’s crust are green coloring agents. The most common ones are iron, chromium, copper, nickel, and vanadium. What’s confusing, but also interesting, is that these elements have different effects on different minerals. Chromium makes an emerald green, but it makes a ruby red! It’s a lot like cooking–different ingredients in different amounts have different flavors. But with so many possible recipes for minerals, the most likely result is green. We have Emerald, Peridot, Turquoise, Tourmaline, Jade, Variscite, Chrysoprase, Grossular Garnet, Chrysoberyl, Sphene, . . . and the list goes on. Let’s concentrate on the first four. Emerald is a variety of beryl. It’s a mineral that’s colored by chromium or, in some cases, vanadium. The most common places to find emerald are Columbia, Zambia, and Egypt. Emeralds have always been treasured by royalty and those in power. Cleopatra’s love for them is well known. Elizabeth Taylor, who portrayed Cleopatra, also loved emeralds. And Napoleon gave his Josephine an emerald suite, famous for its disappearance. A side story on this is that the man who eventually found the jewelry was a known criminal who used undercover agents and deductive reasoning to find the culprits! Emeralds are intriguing. They always come with an interesting story. 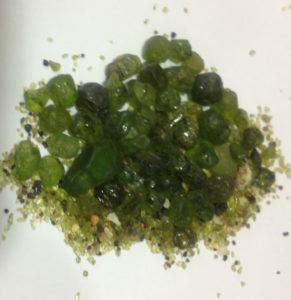 Peridot is the gem quality of the mineral, olivine. The coloring agent is iron. Peridot is mined in Egypt, Pakistan, China, Brazil, and the southwestern United States. Olivine is one of the first mineral crystals formed when volcanic magma cools. Because it’s denser and heavier than volcanic ash and sand, it can collect and create magical places like the Green Sand Beach(aka Papakolea Beach) in Hawaii. According to legend, Pele, the Goddess of Volcanos, cried tears of peridot. Turquoise is typically thought to be blue, but there is a lot of green turquoise, especially where the ground has less copper and more aluminum or iron. Common places to find green turquoise are China, Mongolia, India, the Sinai Peninsula, and the state of Nevada. Turquoise has always been prized. King Tut had turquoise in his treasures, and Queen Victoria had many pieces of turquoise jewelry. While both of them seemed to prefer the “robin’s egg blue” color, green turquoise is gaining popularity in current markets. Two mines in Nevada, the Carico Lake and the Blue Ridge, are famous for their supply of lime and apple green turquoise. Tourmaline comes in many colors because of its complicated chemical make-up, but green is one of the most beautiful. Chrome tourmaline is colored by chromium but, normally, tourmaline’s coloring agent is iron. The mineral is found in many places, including Brazil, Madagascar, Sri Lanka, Tanzania, and the United States. 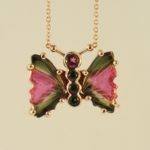 When the green color is combined with pink, the result is bi-colored or watermelon tourmaline. Kermit the Frog always sang, “It’s Not Easy Being Green.” His song was one of sadness for being ordinary. It wasn’t until the end of the song that he recognized his own beauty. 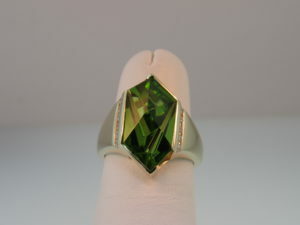 A green gem stone, though, never doubts its beauty, and it’s in lovely company. With so many to choose from, what is YOUR favorite green gem? The accent stone(s) is an important part of some jewelry. It’s meant to enhance the beauty of the center stone and provide added interest to the jewelry. Diamonds are the most often used gem for accentuating a piece of jewelry. They “go” with every other gem, and they add sparkle and richness. But, what if you want something different for your accent stones? Are there rules or best practices that apply when choosing accent stones? An important guideline to follow when creating jewelry is to make sure the accent stones don’t compete with the center stone for attention. Features such as size, cut, polish, and color should all be considered. The size of an accent stone should always be smaller than the center stone, but there are many acceptable proportions. Cut and polish of the accent stones can be similar or quite different from the center stone. 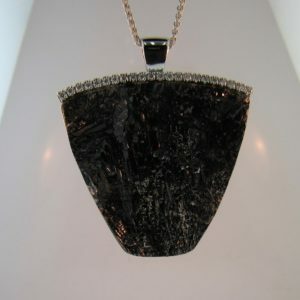 For example, I love the look of this rough drusy quartz with the polished and faceted diamonds. 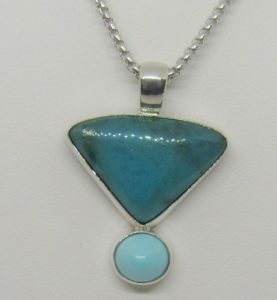 But the smoothly polished chrysocolla and turquoise pendant is also pleasing to the eye. The study of color starts with the color wheel. There are terms for colors that look good together, such as complementary or analogous colors. 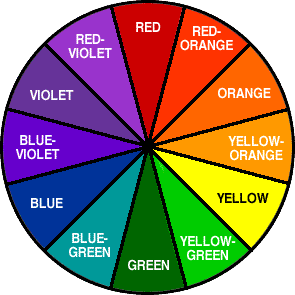 Complementary colors are opposite each other on the color wheel, and analogous colors are adjacent. Monochromatic colors are different tints or tones of the same color. For example, blue and orange are good colors together. And blue with green can be a vibrant combination. But dark blue can look great with light blue, too! In the end, your eye is the best judge of what colors look good together. So much depends on the exact tint and hue of each gem. Some people prefer bold, saturated colors while other people prefer pastels. Don’t be afraid to experiment with the hues of accent stones. 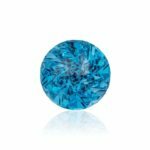 Here are some suggestions for accents to put with birthstone gems. July – Ruby, another vivid stone, would look great with Emerald as long as you’re okay with Christmas colors. 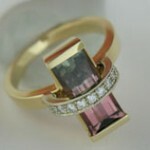 If not, consider Pink Sapphire, with its less saturated,monochromatic hue, as an accent gem. October – Precious Opal, if white, would pair well with Pink Spinel or Tourmaline. If the Precious Opal is black, it would pair better with Emerald or Sapphire. 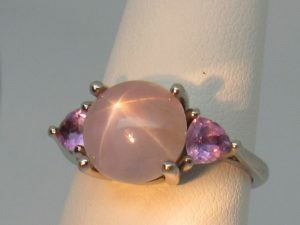 I recently helped create a Lavender Star Sapphire ring. The sapphire had a very pale hue, as star sapphires often do. The goal was to enhance its color with effective accents. 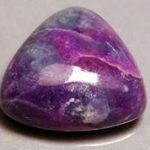 We chose faceted trillion amethysts, fairly light in color but more colorful than the sapphire. When the three were side by side, it really helped the Star Sapphire appear more lavender. This can be another great use of accent stones. Choosing accent gems for your next jewelry project can be lots of fun. Diamonds are wonderful, and they’ll never lose their appeal as an accent stone, but there are lots of other possibilities. We’d be happy to help you figure out your options. Opal can be a confusing gem stone. For one thing, it’s not a mineral like most gems. Minerals have an identifiable crystal structure. Opal has a non-crystalline, amorphous structure, and so it’s labeled a mineraloid. Another unusual quality of opal is all its different variations. Most people think of opal as the stone that flashes different colors. Gemologists call that quality “play of color.” But that only happens with precious opal, which represents about 5% of all opal. Most opal is called “common opal” or “potch opal”, and it shows no play of color. These are just two reasons why opal is, well, complicated. If you are really serious about your gem stones, you’ve probably heard of Black Opal, White Opal, Crystal Opal, Peruvian Opal, and Fire Opal. You know that most of the precious opal comes from Australia or Ethiopia. You understand that an opal doublet is really a layer of precious opal too fragile to survive alone in jewelry, so it’s backed with a non-precious material. An opal triplet is an even finer layer of precious opal, with both a backing and a protective clear quartz dome over the top. But what is Boulder Opal? I describe it as ribbons or veins of opal that are embedded in the host rock it formed within. Because the host rock is tougher and harder than opal, boulder opal is considered more durable. And because the host rock is less valuable, you can get a big piece of boulder opal for much less money than a small piece of crystal or black opal. Boulder opal is mined in Queensland, which is the northeastern part of Australia. Mine fields in places like Quilpie, Bulgaroo, Koroit, and Yowah are yielding a lot of product. 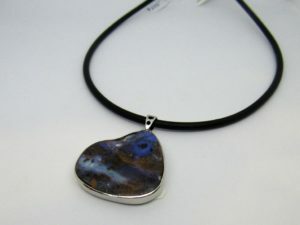 As Boulder Opal has become more popular, these mines have kept up with demand. For the month of May, 2018, we’ve brought several beautiful pieces of boulder opal into our store, courtesy of our distributor, DuftyWeis Opals. They’re only here for a limited time so, if you have the chance, come in to be personally introduced to boulder opal. Gemstones are part of my life. I’m around them all day at work! But many people feel that their interaction with gems and jewels is minimal. Our language, however, is quite “loaded” with references to gems. This pervasiveness means that it’s literally impossible to live life without some knowledge of gems. Many women, and some MEN!, are named after gemstones. Have you ever met an Amber, a Ruby, or a Jade? 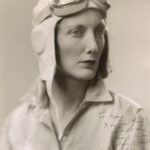 Other well-known names include Beryl, Pearl, Opal, Jett, and Jasper. Names like Gemma and Crystal aren’t gemstone names, per se, but they mimic the idea of gems. And there are plenty of less-common names like Jacinth, Sapphire, and Garnet. Companies like Crayola and Pantene have borrowed names from gemstones to describe their colors. Do you remember coloring with crayons labeled Aquamarine or Amethyst? What about Pantene’s Color of the Year last year–Rose Quartz! Names like Ruby, Emerald, or Turquoise bring colors vividly to mind. The gemstone names can be colorful adjectives, and the entertainment industry has used them for years. Remember Dorothy in the Wizard of Oz with her RUBY red slippers? Or how about Dolly Parton singing about Jolene and her eyes of EMERALD green? 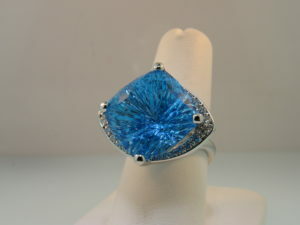 There are sayings and quotations about gemstones. For example, “Diamond in the Rough” means that something or someone is valuable and good, but not polished or finished. “Pearls of Wisdom” means rare and worthy words of advice. Even the Bible contributes to the list with “Pearls before Swine” which talks about not giving out words or things of great value to those who won’t appreciate them. In general, gemstones are used as synonyms for something or someone rare, valuable, and special. 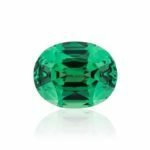 I love these funny quotations about gemstones and jewelry that I came across while researching for this blog. Twinkle, twinkle little star– How I wonder what you are. Up above the world so high–Like a diamond in the sky. Twinkle, twinkle little star–How I wonder what you are. Tom Munsteiner is a fourth generation gem stone carver from Germany. His father, Bernd Munsteiner, is famous for the development of the fantasy cut, and he even has some of his work in the Smithsonian! Tom knew early on that he wanted to carve gems. At age 16 he began training with his dad. One thing I found very interesting is that his dad first taught him how to classically cut gems before attempting any fantasy cuts. By the time he was 22, he had been trained as a Gemologist and was beginning to win awards for his gemstone creations. His work is distinguished from his father’s for its softer, less angular designs. Steve Walters grew up in California. He taught himself how to carve gemstones by reading books and practicing. For a short period, he produced gemstone sculptures for his parents’ company. 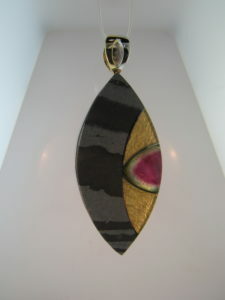 In the mid-1980s he started to carve gems for jewelry. His work is very recognizable as many of the pieces are composites. He might put gems like onyx, citrine, and hematite together, backed with mother of pearl. He’s won several A.G.T.A. (American Gem Trade Association) Cutting Edge Awards, and his booth at the Tucson Gem Show is always one of the most popular. John Dyer grew up in Brazil, the son of missionaries from the United States. When his parents saw his interest in gems, they bought him books and helped him obtain his first rough gem stone material. John tells the story of taking his rough to a cutter who overcharged him and did a terrible job. That’s when he decided to cut his own gems. With lots of practice and a few “disasters”, he’s become one of the most recognized gem stone cutters and has won over 50 cutting awards. 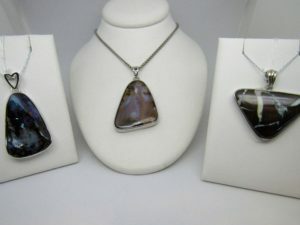 At Dearborn Jewelers of Plymouth, we’ve been fortunate to set gem stones cut by all three of these artists. It’s so gratifying to see these gems being worn and appreciated. Here are some of our designs. If you’re inspired to have your own creation by one of these well-known artists, come and talk to us. We’d love to help. 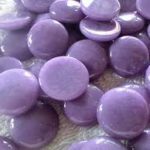 Synthetic Gemstones–What are the Advantages? Disadvantages? The history of lab-created or synthetic gemstones is much longer than you might think. Scientists began making synthetic ruby back in the late 1800’s. Initially, rubies were made for industrial rather than decorative purposes. Ruby is harder than steel, so it can hold up to moving metal parts. It actually helps reduce friction in devices like watches or compasses, allowing the metal pieces to move with a consistent pattern. 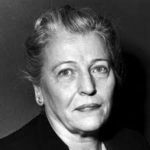 By 1938, Chatham had perfected the process of growing emeralds for jewelry, and he moved on to creating other valued gems like sapphire, ruby, opal, spinel, and alexandrite. Chatham began selling his lab-created gems under the Chatham label. The company is now 80 years old and is one of the leaders in the making of lab-created colored gem stones. Carroll never gave up on his dream of growing diamonds and, in the late 1980’s, the company was successful. Unfortunately, Carroll didn’t live to see this dream come true. In 2018 there are many, many companies that produce diamonds–companies like Brilliant Earth, Clean Origin, and EcoStar. Years of refining the High Pressure, High Temperature technique has led to better quality diamonds. 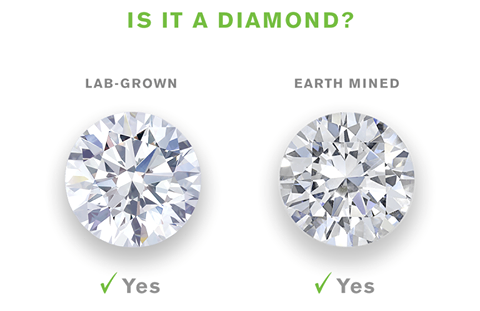 While diamonds have many industrial uses, today’s lab-created diamonds are beautiful and can also be used in jewelry. Anyone purchasing an engagement ring today has a decision to make that his/her parents and grandparents didn’t have to make–Should the center stone be natural or lab-grown? There are pros and cons to purchasing a synthetic diamond or colored gemstone. Some of the advantages are 1) synthetics are less expensive than their natural counterparts; 2) growing synthetics is kinder to the environment than mining for natural stones; and 3) gem cutters can sacrifice more synthetic material to create the perfectly cut gem because, well, you can always grow more! Partly because of these advantages, we’ve seen more customers move towards this option. One big disadvantage of a synthetic stone is that it’s, well, synthetic. Fine jewelry symbolizes pure and natural feelings of love, gratitude, or friendship. How will it feel to wear or give jewelry that has a lab-created stone? Another disadvantage is that synthetic stones will only go down in value. They are a manufactured item and, as the technology improves in the making of them, the cost to produce will decrease. Fine natural gems are rare, and that rarity will keep values high. It’s a decision every consumer has to make for him/herself. What’s imperative is that consumers are presented with clear options, and that they know what they are buying. Gemstones are not obviously natural or synthetic, so customers must rely on reputable jewelers to distinguish between the two. For an important jewelry purchase, go to an A.G.S. (American Gem Society) member store. There you will find associates dedicated to the highest integrity in the jewelry industry. Ask questions and do comparison shopping. And feel lucky to live in a time when there are so many gem stone options. 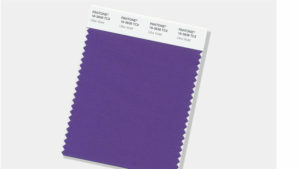 In December, Pantone came out with its Color of the Year. This year it’s Ultra Violet. My mind goes to the gemstones that exhibit this glorious hue. Many people will think of Amethyst and Tanzanite. I’d like to introduce some other options– two gems most people have never heard of and two gems most people have heard of but never in this hue. SUGILITE was first identified in 1944 by Ken-ichi Sugi from Japan. But gem quality Sugilite wasn’t discovered until 1979 in South Africa, making it a very new gem in the jewelry industry. The color ranges from a pinkish purple to a deep bluish-purple. The hardness is between 5.5-6.5 on the Mohs scale. 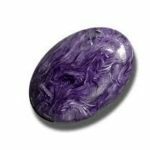 Sugilite is generally cut as a cabochon because it’s opaque. It usually has veining and a mottled appearance. CHAROITE is another “young” stone. Named after the Chara River in Eastern Siberia, the only place it’s ever been found, it was discovered in the 1940s but not really known until 1978. The stone ranges from lavender to purple in color, is usually opaque, and is readily identified by its swirling, fibrous appearance. Considered a rock rather than a mineral, its hardness on the Mohs scale is listed as 5 – 6. JADEITE has been known and valued for centuries. It comes in many colors, not just green. Lavender jade is beautiful! 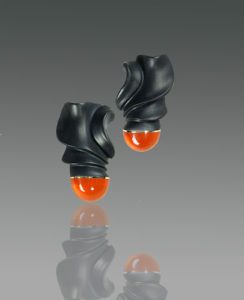 It can be semitransparent to opaque and is usually cut into cabochons or beads. It comes from many different places–Myanmar, New Zealand, Russia, and Canada to name a few. Jade is a harder, tougher stone than either Sugilite or Charoite. But it also has the possibility of being dyed, which brings down the value. Neither Sugilite nor Charoite undergo treatments. Always ask if the jadeite has been treated or enhanced before you buy! PURPLE SAPPHIRE is very rare, coming usually from Sri Lanka or Madagascar. Again, sapphire has been valued as a gemstone for centuries, but most people don’t know that it comes in so many different colors. Most sapphire is heat-treated, but purple, lavender, and violet sapphires usually don’t need to be. 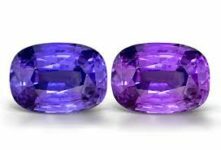 Purple sapphire has a Mohs hardness of 9, so it’s the most durable of the options presented here. 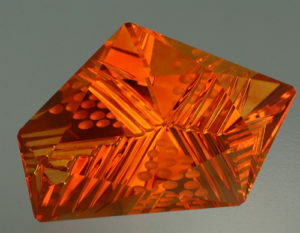 Because it’s hard and transparent, this gem is usually faceted. Not surprisingly, it’s also the most expensive option listed. Amethyst and Tanzanite are lovely purple gems, and they would work well with this year’s fashions. But now you have LOTS of options if you want to be “styling” with the Color of the Year!